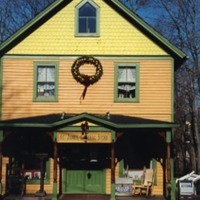 A photograph of the Saint James General Store located on Moriches Road in Saint James. The building exterior is of yellow clapboard and green trim; under the roofline, scallop clapboard is visible. 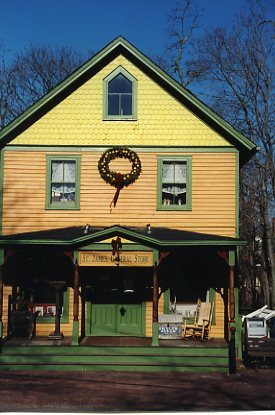 The store sign can be seen hanging over the porch entrance and a holiday wreath and bow are also visible. Harrison, Robert L.	, “St. James General Store,” Hofstra University Library Special Collections: Digital Collections, accessed April 18, 2019, https://omeka.hofstra.edu/items/show/740.